Here is the thirty-fifth post of the 100 WC for Grown ups. 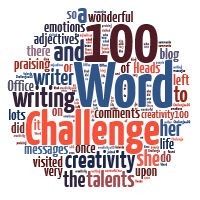 It is a weekly challenge for all those writers who want to extend their audience to get feedback on their work. The prompt this week is to go back to last week’s entries. You are to use the last 10 words of the post next to yours and using just 100 words create a story. It may be a follow-on from the previous one or you may like to take it in a different direction. The entry next to mine was An Invitation to Tea. Alice sat up in bed. It was only a dream! She rubbed the sleep from her eyes, looking down she saw that her hands were covered in blood. She gasped, thinking back to her dream. All around the room started to spin; Alice felt bile rise to her throat as the smell of iron from the blood hit her. Something moved underneath her duvet, she let out a scream and threw them back, revealing a little white fluffy bunny. Snuggling into her leg. It was only a dream, or was it?